Your mother might have said, “it’s not only what you say, but how you say it,” but it applies to e-newsletters as well. How you “talk” to your customers via the words in your newsletter’s articles can greatly affect the publication’s success or failure. Even if it’s a technical subject, your words must still speak to the reader, not at them. The trap most e-newsletters fall into is one of voice. You see your e-newsletter as a representation of your company. Therefore, you want to use grammatically correct, complete sentences and an impressive vocabulary. But NOBODY speaks like that. If somebody does, he/she is in the vast minority. Therefore, you end up with a more “professional” voice, but in reality, you end up talking down to the reader or, worse, boring them. Using the word, ‘you’ can help you involve the reader and create this conversational style. That does not mean every sentence requires a ‘you’ reference. Just enough to keep the flow. Unfortunately, wanting a conversational newsletter and being able to pull it off are two different things. Most non-writers will try to “write” when asked to produce an e-newsletter article. That’s when you get the thesaurus-ridden copy that’s so dry it’s a fire hazard. MOST IMPORTANTLY, no matter which option you choose, select one person to write your newsletter. Newsletters that contain articles written by several different contributors sound a bit like conversations with two or more people speaking at the same time. Unless you have bylined stories or columns, your newsletter should speak with one voice—whether that’s done in-house or contracted out. The fix pretty much holds true. One caveat about conversational tone. There are many interpretations of what that might mean. What’s conversational to one person might seem improper to others. For example, emojis might be all the rage on social media, but probably have no place in your company newsletter. This blog was originally part of Nobody Reads Your e-Newsletter…And How To Fix It. You may genuinely want to educate people on your product or service (and that is a great way to do it). Yet, the prime motivation for that is to get your target audience to do something. Whether it’s buying more mutual funds, making a charitable contribution, or renewing a membership, there’s always an objective beyond putting out information. Your story selection should never lose sight of that fact. Now, if Bob Jones’ department adds a new server that’s going to help Company Y process orders 10 times faster than the competition, that gets people’s attention. Especially if you are a potential client or a former client who may have stopped using Company Y because of slow service. When creating a story list for your e-newsletter, take a step back and try to imagine what your customers want to read. What’s bothering them, making their day-to-day business life more difficult? If you come up with a blank, ask one or two of them with whom you have a relationship. Most customers, when asked in a casual, non-confrontational manner, will tell you what’s on their mind and then some. From there, you have a good start to developing a story list. And if the stories in your publication make your customer’s life easier, solve a problem, save money, or make money for them, they will read your e-newsletter. Promise. Giving your readers what they want is only part of it. You must give them the next step or call-to-action as well—even if that seems fairly obvious. So, if they read your article, enjoy it enough to want to receive more similar articles, you have to tell them how to do that: click on the attached link to sign up for future newsletters or our special report. You can even make a case that every article you include in your newsletter must ask for some type of action. This blog was originally in Nobody Reads Your e-Newsletter…And How To Fix It. Sadly, we’ve become a society of readers with ADD. There are just so many demands for your readers’ attention that if you are lucky to get their attention, you don’t want to jeopardize it by overloading them. In other words, if you create an e-newsletter where they have to scroll, they will roll. Try to keep the length of your e-newsletter to 300-400 words if it’s one article. If you have more you’d like to say, you can always add a link to your website with more in-depth coverage. If you want to have more articles in your e-newsletter, list the headlines of each article and then have a one or two-sentence description of the article underneath with a link to a more in-depth article on your website. Just like your subject lines, your article headlines will have to be attention-grabbing to get them to click. This tactic offers another advantage in that most e-newsletter programs have reporting functions so you know who is clicking on what. This lets you know which prospects might be interested in what your company offers and gives you some intelligence so you can do some follow-up. 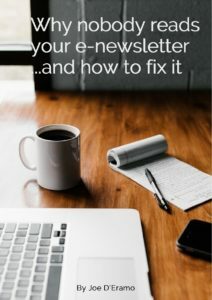 This was taken from Nobody Reads Your e-Newsletter…And How To Fix It. When the last edition of this came out, size of an article certainly mattered. With the increased popularity of mobile devices, readers aren’t as averse to scrolling. You still should not overload them with text. For longer articles, draft a paragraph or two and then provide a link to the entire article.